Behold the power of beer! 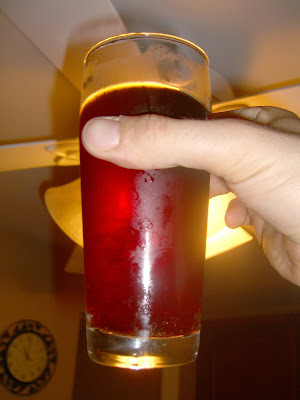 Awful camera work and lighting, but you can see the carbonation that was developing. So far, I'm not overly impressed. It's much more sweet than I wanted it to be. I'm hoping the bottle conditioning followed by some fridge time changes things a little along with some natural carbonation. For now, I'll just wait and see. I plan to let the beer carbonate for 2 weeks in the same air conditioned room the primary and secondary sat in. Then, I'll just move the whole lot to the fridge. The German style is most often characterized by a medium to full body, a malty flavour balance, a wide range of colours, and a clean dry finish, though wide variations are notable amongst German breweries marketing Märzen. Amongst these variations are colors ranging from pale to dark brown. I'm not so sure about the dry finish, but I suppose the wide color range makes the makes my beer acceptable, although I think a lighter more orange/amber color would have been better. 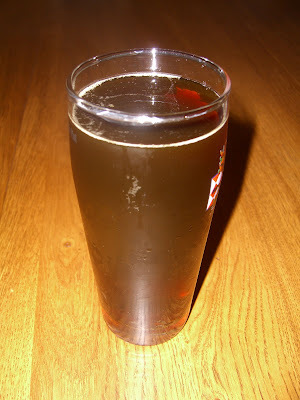 On the positive side, this is the clearest beer I've ever made, even if my poor photography doesn't make that abundantly clear. Click on the blurry image on the right for a better idea of how clear it is. I guess everyone was right about the magic of the secondary. This video, again poor quality, gives a better impression of the clarity. The bottle I tested had some carbonation in it, but again, yeast haven't had enough time to do their thing yet. All things in good time I suppose. With that said, I wonder if I should let it bottle condition a little longer than 2 weeks before plopping the batch in the fridge. I'm not sure another half a week will be enough time to right all the wrongs I've found in this brew. What do you think? how much longer should I give it before I stick it in the fridge? Aww man, I'd love to come, but I'm off to Virginia after work - weekend getaway with a couple of friends. Never fails - whenever I have something planned, a beer festival pops up. Let me know how it turns out!! Hi there. In your posting you made the comment that your brew tasted a little to sweet. With my own experence I have found that if the wort is bottled to soon the yeats don't have a chance to consume the fermentable sugars. Leftover sugars will remain in the brew as it turns to beer in the bottle. If you refrigerate the beer soon after bottling the conditioning will be stunted and slow down dramaticaly. Hence the sugars are not consumed and your beer tastes sweet. The big problem is that if you allow the beer to condition at cellar tempretures the live yeast in addition to eating up the extra sugar added to aid carbonation will continue to ferment any residual sugars left over from a partially fermented wort. In short your beer will end up being over carbonated, or worse, explode! Brock, thanks for the comment... I think, in this case, the flavor issues, and the low carbonation thus far, indicate not enough yeast, and perhaps some scorching issues... Not sure though.